San Marcos, CA — The future-ready ST100 Series Air/Gas Mass Flow Meter from Fluid Components International (FCI) ensures wastewater treatment and water treatment process engineers and operators, and their consulting engineering firms, the greatest ability to interface with any existing control system communications, as well as the ability to adapt to a proposed change in the communications. The ST100 Series features the most extensive selection of analog and bus communications available today, along with the capability to be field changed/upgraded between any of them at any time in the future. The FCI ST100’s outputs utilize a modular plug-in card system, allowing them to adapt easily to a change in a plant’s automation strategy. Engineers and plant operators can specify and install an ST100 today with the confidence of knowing it will not be obsolete, and in fact be an asset, if they decide to deploy a new instrument communications method. This “future-ready” ST100 Flow Meter provides analog interfaces that include: triple 4-20mA analog outputs, frequency/pulse and alarm relays. Digital bus communications available include: PROFIBUS-PA, HART Modbus and FOUNDATION fieldbus. HART is standard and included with the analog outputs interface. All of these outputs are interchangeable at any time. All measurements, including flow rate, total flow, temperature, and pressure with the STP models, are provided on outputs or over the bus communications. All ST100 Flow Meters also include a serial I/O port via a standard USB interface and an Ethernet port with its own assigned IP address. The ST100’s HART I/O is fully compatible with the latest Version 7 standards. Today the ST100 is with the HART organization undergoing the final stages of its testing for independent certification by the organization. The ST100 already has received its certification from the Fieldbus Foundation™ organization and was one of the first two instruments ever to be certified to meet its advanced diagnostics criteria. In municipal water and wastewater treatment plants, thermal dispersion flow meters are the technology of choice and most preferred solution in the aeration basin air flow, digester gas systems, digester gas-to-cogen or CHP systems, as well as in ozone and other disinfection gas systems. Designed for these applications, FCI’s ST100 is an all-new, thermal dispersion technology gas flow meter. Its advanced design combines the most feature- and function-rich electronics with the industry's most advanced flow sensors to achieve a truly state-of-the-science flow metering solution for these applications in water and wastewater treatment plants. In addition to the adaptable communications outputs, the ST100 features a best-in-class graphical, backlit LCD display. It continuously displays all process measurements, alarm status and a user defined field, and when needed instrument health and service diagnostics. 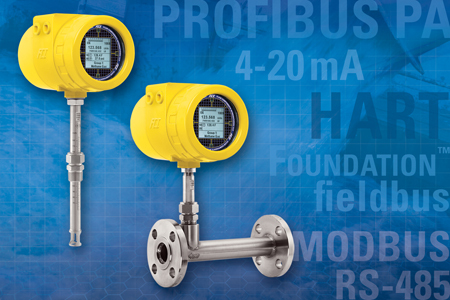 The versatile ST100’s STP models include pressure measurement, which makes this FCI instrument the first and only triple-variable (flow, temperature and pressure measurement) thermal dispersion flow meter in the world. Adding temperature and pressure capability reduces the need for separate instruments and wiring runs. Standard on all ST100 models is an on-board data logger, capable of storing 21 million readings on removable 2GB micro-SD card. It stores and recalls up to five (5) unique calibrations and with extended calibration routines achieves up to 1000:1 turndowns. Flow ranges to as low as 0.25 SFPS (0.07 NMPS) up to 1000 SFPS (305 NMPS) are available and accurate to ±0.75 percent of reading, ±0.5 percent of full scale. The rugged ST100 Flow Meter is designed for industrial process and plant applications and offers service up to 850ºF (454ºC). Both integral and remote (up to 1000 feet [300 meters]) electronics versions are available. The ST100 is agency approved for hazardous environments, including the entire instrument, the transmitter and the enclosure. Instrument approvals (submitted and pending) include: FM and FMc: Class 1, Division 1, hazardous locations, Groups B, C, D, E, F, G; ATEX and IECEx: Zone 1, II 2 GD Ex d IIC T4; The rugged enclosure is NEMA 4X/IP67 rated.